For further info go to http://mrlocksmith.com/. Hi, I’m Terry from Mr. LockSmith. We are a BC government-licensed locksmith company. All of our Mr. LockSmith locksmiths have been criminal records checks, nobody has a criminal record. We are licensed, insured and bonded. We’re BC government licensed. 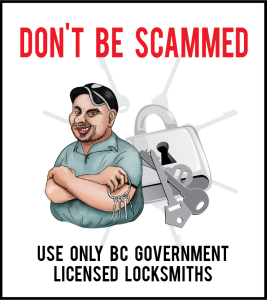 A huge problem in the Lower Mainland is the scammer locksmiths. They’re unlicensed, they’re advertising mostly in Google AdWords, they say $15 or $25, they will do the service call. 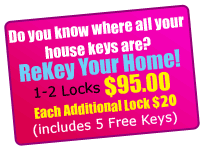 No reputable locksmith will come out for $15 and do your re-key or do your lockout. The scammers end up charging you hundreds of dollars, they will rip you off, a lot of times they will do cash only, and you have no idea who came to your house and did your job. Usually they come two of them, and they intimidate you into paying you cash. Recently in the Lower Mainland, they got the customer, they did the re-key, they got the customer, they drove them to their bank so they could get cash, why the customer was inside at the ATM, they drove back to the house, with the key now, opened up the house and ripped off lots of stuff outta their house. So again, don’t trust these $15, $25 unlicensed locksmiths. Mr. LockSmith is a reputable BC government licensed and insured locksmith company. All of our locksmiths have had criminal record checks, and nobody has a criminal record. We take Visa, Mastercard, or cash. Our machines always work, they’re never down, you don’t have to run to your bank. Don’t trust these 15 or 25 dollar unlicensed locksmiths, they will rip you off.